Plan a safe New Year’s buffet with suggestions from the FDA. Many people have open houses for this holiday and offer food buffet style. The first tip is to keep serving portions small. Instead of putting out all the food at once, divide the food among some small platters and dishes ahead of time. As the food is eaten, replace those serving dishes with clean ones with fresh food. Store cold back up dishes in the refrigerator, and keep hot dishes in a crockpot, or in the oven set at 200 to 250°F. Later arriving guests can safely enjoy the same food as early arrivers. Make sure that you take the temperature of the food as it sits out. Hot foods should be at least 140°F. Some warmers only hold food at 110°F to 120°F, so make sure that your warmer will keep foods at the correct temperature. The danger zone is between 40°F and 140°F; that’s when bacteria grow quickly. Eggs and egg dishes can be refrigerated for serving later, but should be reheated to 165°F before you serve them again. Cold foods need to be kept at 40°F or below. Keep cold foods refrigerated until serving time. If the food is going to stay out of refrigeration more than two hours, put ice under the food to keep it cool. Make sure that you don’t add new food to an already filled serving dish. Replace nearly empty dishes with freshly filed ones. Also be aware that bacteria from people’s hands can contaminate the food. Watch the clock during your party. If perishable food is left out at room temperature for more than 2 hours, it must be discarded unless you know you are keeping it below 40°F or above 140°F. And if you send leftovers home with guests, make sure they refrigerate the food within two hours after it has left the fridge, not two hours after you have packed it for them. Watch out for old family recipes. Some call for raw or lightly cooked eggs, especially mousse, eggnog, Caesar salad dressing, and rice pudding. Use pasteurized eggs, or add eggs to the liquid called for in a recipe, then heat, stirring constantly, until the mixture reaches 160*F.
Finally, remember the four phrases of safe cooking and baking: Clean, Separate, Cook, and Chill. Clean your hands and cutting boards and rinse produce before eating. Separate raw meats from other foods. 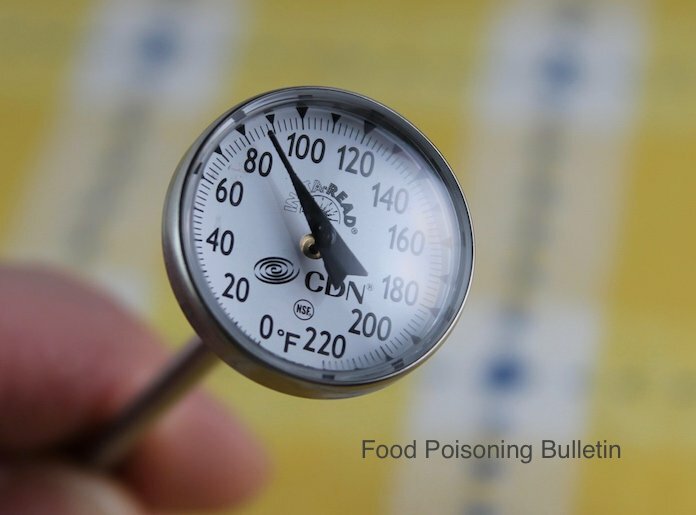 Cook foods to safe final internal temperatures as measured with a food thermometer. And chill food promptly and make sure your appliances are operating normally.